341 - Who Should Perform Behavior-Based Safety Observations? Greetings everyone, this podcast recorded while in Galveston, TX. I’d like to share an article I wrote that was published May 2014 in BIC Magazine. The published article can either be found on the magazine’s website or under Insights at www.ProActSafety.com. The emphasis on the concept of confrontation in safety is epidemic. Consultants, books and articles taut the virtue of teaching workers to confront each other over safety issues. They claim that the willingness and ability to confront may be the key competency of safety. They argue that it must become unacceptable to see a risk being taken and not confront the individual taking the risk. The basis of this misguided concept goes back to two core misconceptions of safety thinking, (i.e. the idea that the goal of safety is to fail less and that all risk-taking is a matter of worker choice). When one worker sees another being bad there must be a confrontation to make the worker less bad. The worker taking a risk simply made a bad choice and confrontation will result in less-bad decisions in the future. The truth is that safety excellence is about achieving success, not simply avoiding failure and that there are organizational influences that impact workers’ decisions that need to be discovered and addressed if lasting change is to be made. The alternative to the concept of confrontation is the concept of coaching. Coaching is a way to achieve success rather than simply avoid failure. It involves workers building on each other’s strengths rather than simply trying to correct their weaknesses. It is built upon a vision of success in which everyone helps each other reach a goal. It necessitates a vision of success and helps to identify organizational influences on workers’ behavioral choices. Confrontation weakens relationships and culture and seldom results in lasting change. Coaching builds relationships and culture and almost always results in improved performance. Workers listen to their allies differently than they listen to their critics. Confrontation creates either enmity within the safety culture or avoidance behavior that has the appearance of confrontation without the reality. Either damages the very fabric of what it is supposed to improve. 335 – Who Should Implement Behavior Based Safety? Greetings everyone, this podcast recorded while in Anchorage, Alaska. I’d like to share an article I wrote that was published March 2014 in BIC Magazine. The published article can either be found on the magazine’s website or under Insights at www.ProActSafety.com. Greetings everyone, this podcast recorded while in Decatur, AL. I’d like to share an article I wrote, published September 2013 in OH&S Magazine. The published article can either be found on the magazine’s website or under Insights at www.ProActSafety.com. Greetings everyone, this podcast recorded while in Las Vegas, NV. I’d like to share an article I wrote, published July 2013 in OH&S Magazine. The published article can either be found on the magazine’s website or under Insights at www.ProActSafety.com. Greetings everyone, this podcast recorded while in Billings, MT. I’d like to share an article I wrote that was published December 2012 in BIC Magazine. It was titled, Avoiding the 10 Common Pitfalls of Behavior-Based Safety. The published article can either be found on the magazine’s website or under Insights at www.ProActSafety.com. I hope you enjoy the podcast this week. 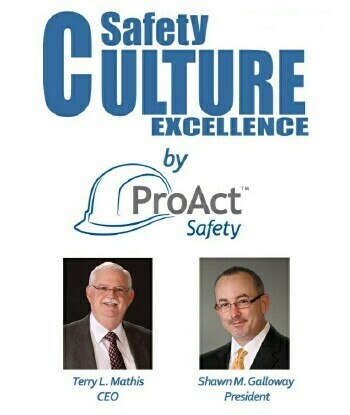 If you would like to download or play on demand our other podcasts, please visit the ProAct Safety’s podcast website at: http://www.safetycultureexcellence.com. If you would like access to archived podcasts (older than 90 days – dating back to January 2008) please visit www.ProActSafety.com/Store. For more detailed strategies to achieve and sustain excellence in performance and culture, pick up a copy of our book, STEPS to Safety Culture Excellence, available through WILEY (publisher), Amazon or Barnes and Noble. Greetings everyone, this podcast recorded while in Memphis, TN. I’d like to share an article I wrote that was published November 2012 in my column BIC Magazine. It was titled, A.W.A.R.E. – Five Steps To A Successful Safety Observation. The published article can either be found at www.BICAlliance.com or under Insights at www.ProActSafety.com. I hope you enjoy the podcast this week. If you would like to download or play on demand our other podcasts, please visit the ProAct Safety’s podcast website at: http://www.safetycultureexcellence.com. If you would like access to archived podcasts (older than 90 days – dating back to January 2008) please visit www.ProActSafety.com/Store. This session is designed to be an introduction to the rationale and practice of BBS for newcomers and a thorough review for participants at the workforce and management levels. The supporting roles of management and supervisors will be discussed. The support roles in BBS are less active than the participants' roles, yet more critical for success and sustainability. In addition to understanding what BBS is and how it works, managers and supervisors need to know the rationale for having a process and the strategies for ensuring it is successful. Attendees will be thoroughly versed on the basics of BBS to either return to a project or attend the Annual BBS Conference with purpose and focus. ProAct Safety® has successfully certified over one thousand Internal Consultants across every major industry. The Lean BBS® Internal Consultant Certification Workshop is designed for organizations that desire to internalize and sustain their own approach to Behavior-Based Safety (BBS). This intensive, highly interactive workshop will fully qualify attendees to return to their organizations and design a customized plan to strategically implement or improve an existing Behavior-Based Safety process. This approach is ideal for companies who want to maximize their own ability to implement the most effective and efficient approach to BBS, regardless of challenging industry or logistics; or who want to ensure a proven approach to find new sustainable results while minimizing outside costs. This workshop will train participants to utilize ProAct Safety®'s proven Lean BBS® methodologies for facilitating an implementation. Most importantly, it will prepare the attendees to anticipate and address the issues that can challenge the success to Behavior-Based Safety approaches. Participants will be able to identify opportunities to minimize the perception of change, achieve the quickest success possible, and ensure long-term process sustainability. This approach is not a train-the-trainer course, nor is it intended to teach individuals to simply deliver training on Behavior-Based Safety. Every site will have its own unique challenges and cultures. To allow the internal consultants the most opportunities for success, it is extremely important they understand and internalize the strategies to identify the site-specific variables that have become, or could become, problematic barriers. Lean BBS® utilizes aspects of performance and quality systems to drastically reduce the typical internal resource requirements of a Behavior-Based Safety process. Lean Behavior-Based Safety® focuses on leveraged use of resources resulting in quicker and more sustainable results in a shorter time, with less disruption to operations, and less resistance from workers and unions. Unfortunately, it is common to see the results from many traditional Behavioral Safety processes plateau after the first two to three years of operation. At that point, the process can become routine and lose the original result-based orientation. The successes that motivated the process early-on disappear and the entire process tends to slowly lose momentum. Successful Behavior-Based Safety processes do not typically fade away, but can be much less effective than they are capable of being. This is the perfect time for BBS process improvement. Greetings everyone, I wanted to share with you a new workshop we have created to help you further improve your safety culture and performance and achieve safety culture excellence. To see the currently scheduled dates and locations around the world, please visit www.proactsafety.com and click on the events tab. If you would like information on a private workshop, seminar, keynote speech or consulting, contact us at info @ proactsafety.com This particular workshop is titled: Behavior-Based Safety 101.